For the best angles to shoot along each bastion face as well as the walls, the most practical overall shape to the new artillery fort became a pentagon, with sturdy bastions protruding from each corner of the pentagon. Each of the five sides (and usually likewise with the five bastions) was the same size. 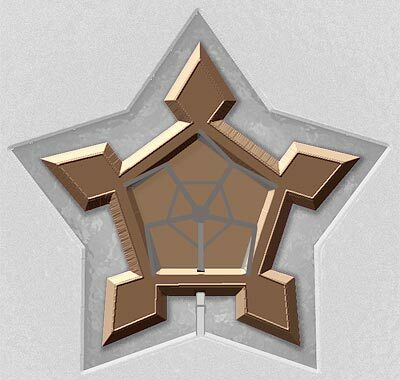 From this shape comes the term used occasionally for this design: star fort. Some small forts were laid out as rectangles and a few were even triangular in design. The angling on the bastion fronts varied, with fortresses in the Low Countries having sharper angles and usually set within 250 yards / 220 meters of each other to have one within musket range of the other. Central point with streets radiating out, as shown in the illustration. A grid pattern, which offered a bit more space for buildings, but perhaps movement was not quite as fast as could be had with radiating streets in #1. 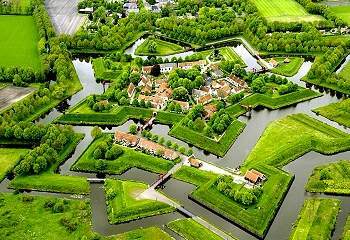 An outstanding example of symmetrical pentagon design is the restored Fortress of Bourtange in the eastern Netherlands. A visitor can walk around the inside and outside the restored fortress, which has tourist accommodations and a museum. As efficient as the pentagon design was, it could be too much for a scaled-down fortification, in which case four bastions were made or even three. Such clean, geometric architecture could only be practically applied to new defenses set out on land not already occupied with a city or town. Established towns and cities required the new Trace Italienne to bring their defenses out of the Middle Ages. But to retrofit what was already there ruled out simple, even geometry.